You can connect a Captivate project to your Learning Management System (e.g. Canvas) gradebook if you want to see how a student did on a quiz or activity within a Captivate learning object. 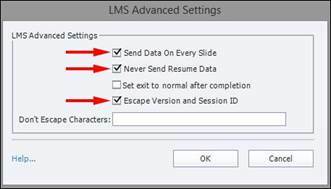 Captivate uses a standard called SCORM to communicate with the LMS gradebook. Why would you want to use a SCORM enabled Captivate object? SCORM enables you to connect a Captivate object to a LMS gradebook item. It can be especially useful for professional programs where there needs to be a record of a student completing an online activity. 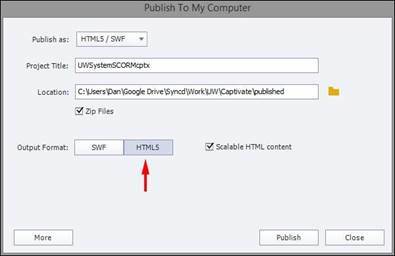 Why wouldn’t you want to use a SCORM enabled Captivate object? 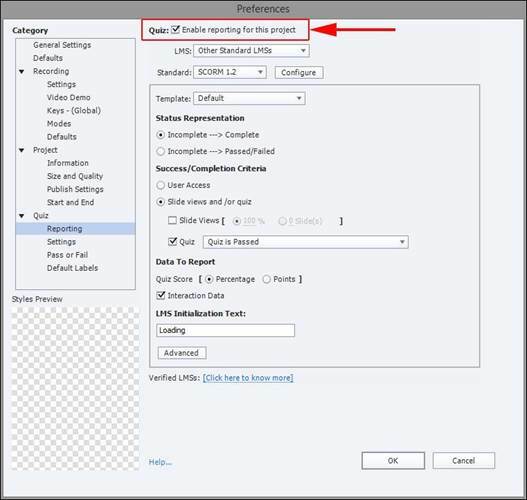 Additionally, if you plan to use the Captivate project on a website, you will want to disable grade reporting and SCORM before you publish. If you don’t, you’ll get an error message when you display the project on your website. Begin by carefully considering your needs for tracking of student progress and scores. For example, consider whether it is important that students be able to continue an interrupted lesson precisely where they left off, or whether grades will be assigned. If grading will be done, you must define what a student must do to be "complete" or "successful." For example, is credit gained by simply accessing the exercise, or must a student view a number of slides, or achieve a minimal quiz score? Leaving scoring options at their default settings will likely result in undesired grading. Plan on testing your Captivate SCORM project inside your learning management system after you have uploaded it. If you want to create a Captivate learning object that reports a grade to a learning management system you’ll first need to enable reporting in your Captivate project. After launching Captivate and creating a new project or loading an existing project click on File → Project Info. 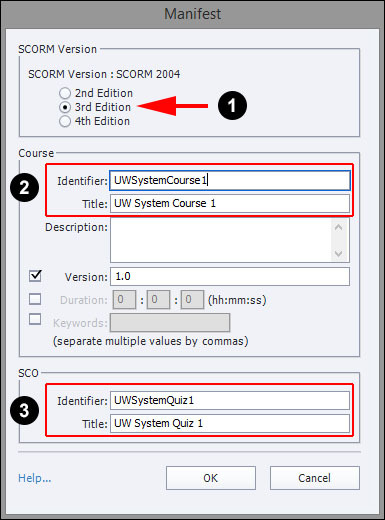 Click the Configure button next to SCORM 2004. Checking Never Send Resume Data doesn’t allow students to pick up where they left off if they leave a learning object mid-way through but the data reporting is cleaner for learning management systems like Canvas. When you are done click OK. 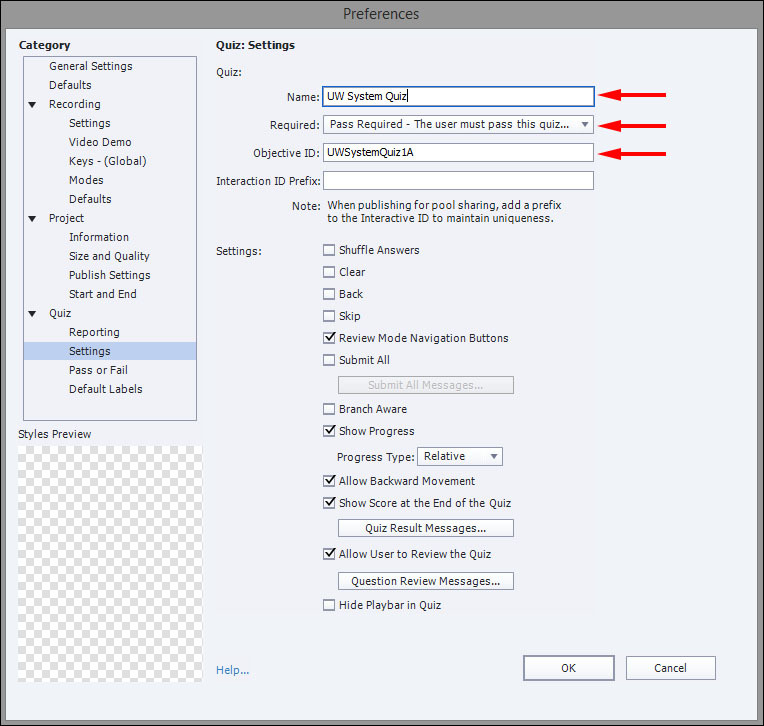 There are many other options you can set in the Preferences → Quiz → Reporting, Settings, and Pass or Fail preferences. There are too many options to go into in detail here, but make sure you set aside enough time to do some testing to make sure the quiz reporting works like you expect. You can find a more extensive reference on the settings here. Look for Reporting near the bottom right. Make sure Report Answers is checked. A default Interaction ID should exist for your quiz question. Enter something that will make more sense to you when you are looking at your SCORM report. You can also click on your other Captivate questions to set their Interaction IDs as well. 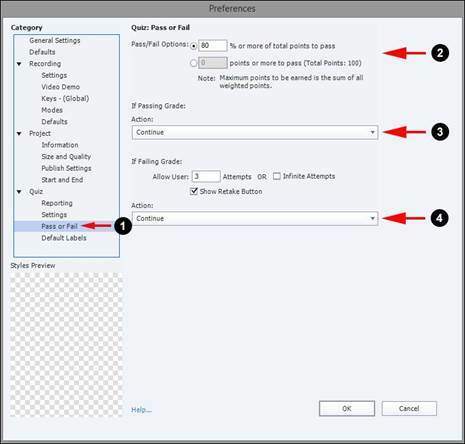 You have now completed the basic setup of your Captivate project in preparation for publishing and uploading to an LMS and connecting it to your gradebook. When you are ready to publish, select File → Publish or by clicking Publish → Publish to Computer on the toolbar. Click the More button in the lower left of the window. The window will expand. 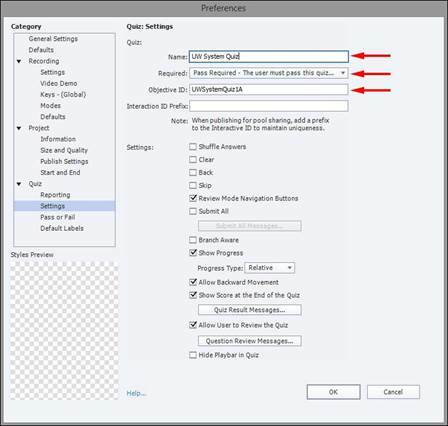 Here you can see a link the eLearning Output settings. If you want you can click the link to further refine your settings. After you have imported your project into your learning management system take some time to test it to make sure the grade being reported to your gradebook is what you are expecting. Please note that SCORM reports are not available in Canvas. You will only get the grade from your Captivate module reported to the Canvas gradebook.